The ones we need specifically are checkValidity,setCustomValidity and reportValidity but it looks like it's missing a few others too. The other question we had was around the behaviour of the @api validity property. 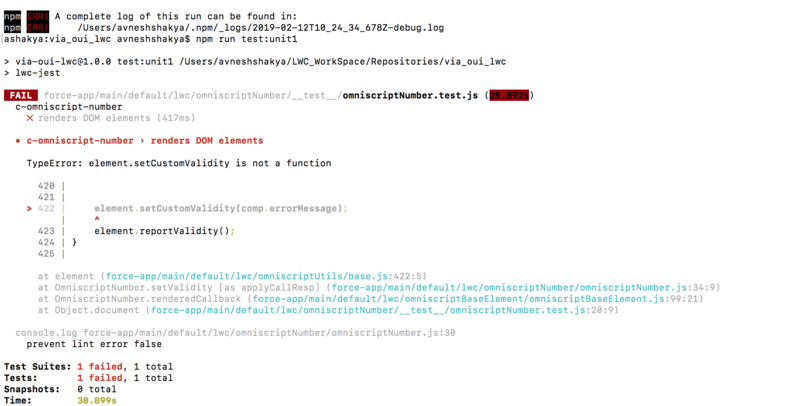 From testing at runtime it seems this is always populated with a default object for us, but during testing it's empty. I understand it can be populated during our tests manually, but it would be nice to have it initialized with the same default as the real component. Thanks for the issue and the PR to fix! FWIW I'll be working on a new script to generate the mocks soon that should be much more reliable (the metadata file the mocks are currently generated off of is not 100% up to date). The new script should catch these missing methods going forward. Regarding the validity property, according to the documentation this prop should be updated to an object with a bunch of boolean attributes like badInput, customError, etc. Is that what you're seeing at runtime or is it really an empty object? @mattgoldspink To clarify though, if you remove the validity instantiation from your PR I'll merge it. It's a good fix until the new script is in place. @trevor-bliss Sorry for the delay, got sucked into other priorities. I fixed the validity field and updated the PR. Let me know if there's anything else needed. @mattgoldspink No worries, thanks again!